In countries transitioning from conflict or authoritarian rule, it is crucial that all members of society – especially women and minorities – are included in the envisioning and building a new future. While many transitional justice models sideline these voices, the Coalition’s Global Initiative for Justice, Truth and Reconciliation (GIJTR) does the opposite, prioritizing the stories of marginalized communities, knowing that only when these populations are fully engaged can cycles of violence be broken. 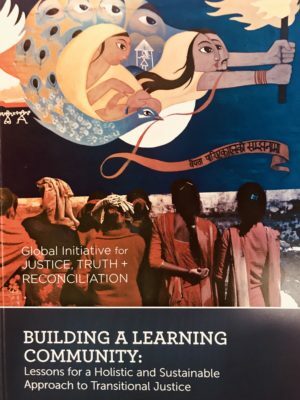 In December 2017, GIJTR published Building a Learning Community: Lessons for a Holistic and Sustainable Approach to Transitional Justice, which shares lessons learned from its work in Colombia, South Sudan, Sri Lanka, Syria and elsewhere. To read the publication online in English, click here. To read it in Arabic, click here.